A Taliban commander announced a unilateral cease-fire Monday in a northwestern Pakistan region where the military says it has killed around 1,500 militants in an ongoing offensive. The military was not available for comment on the Taliban's move in Bajur region, which is a major transit route for militants traveling to fight U.S. and NATO forces in neighboring Afghanistan. It follows the introduction of an already week-old cease-fire between the government and militants in the Swat Valley, another northwestern region, in support of a peace process there. The United States and other Western governments have criticized the Swat truce and negotiations, saying they could create a safe haven for al Qaeda and Taliban in the region. Unlike in Swat, the Taliban in Bajur had been losing ground in recent months, most analysts say, and the military has several times claimed to be close to victory. Taliban commander Maulvi Faqir Mohammad, announced the cease-fire, in an FM radio broadcast. "We have decided to observe a cease-fire," he said. "I direct all of my fighters to stop armed actions against the government," he said. "We will take strict action against anyone who violates the order." Pakistan is under intense international pressure to crack down on al Qaeda and Taliban militants in the northwest blamed for increasing attacks in Afghanistan and Pakistan. U.S. officials also fear the region is being used to plan terrorist attacks on the West. Earlier Monday, the paramilitary Frontier Corps in Bajur announced it had captured the Bhaichina Heights from militant control, which it said had great tactical importance to the extremists. It was unclear if Mohammad's announcement was related to that operation. A government administrator in tribally ruled Bajur said authorities were aware of Mohammad's announcement. "We do welcome it. If they will not fire bullets, we will also consider taking a lenient view toward them," Faramosh Khan told The Associated Press. The military began its offensive against militants in Bajur in September last year and claims to have killed around 1,500 Taliban fighters. The United States has praised the offensive and said it has stemmed the flow of fighters in Afghanistan. The truce in Swat, in the North West Frontier Province, has prompted concern in the West because a peace deal last year in the former tourist haven allowed militants to regroup and rearm before breaking down, officials have said. 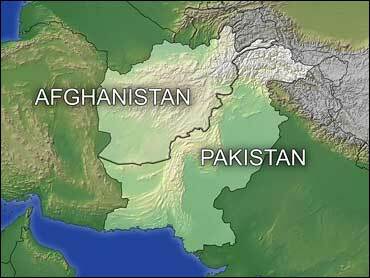 Pakistan has offered to introduce a mild form of Shariah Islamic law in the valley if the Taliban stop fighting. Prior to the initiative, the Taliban were in control of much of the area in defiance of a military offensive, something that analysts say means the movement will be able to dictate terms to the government. In an interview over the weekend, military spokesman army spokesman Maj. Gen. Athar Abbas said there were no plans to replicate the Swat approach in Bajur or a neighboring region where the military is also undertaking an offensive. He claimed both operations were succeeding in rooting out al Qaeda and Taliban fighters. On Sunday, authorities in the North West Frontier Province said they planned to arm villagers with 30,000 rifles to help fight militants, but it was unclear if the announcement had the backing of national leaders or the country's powerful army. Village militias backed by the United States have been credited with reducing violence in Iraq. Washington is paying for a similar initiative in Afghanistan.